Stylish outdoor kitchens are the latest trend in outdoor entertaining. Choosing the right grill and accessories for your perfect backyard entertainment center is important. It’s your personal touch to your outdoor kitchen, a reflection of your lifestyle. Twin Eagles design is truly unique, with exclusive geometric shapes, contoured angles, seamless welds and hi-polished accents. Every grill is an intriguing blend of modern design and classic elegance, making them a perfect match for both traditional and contemporary architecture. The unrivaled Twin Eagles Cooking System, developed by award-winning Gas Engineer Dante Cantal, is what separates Twin Eagles from all other grills. 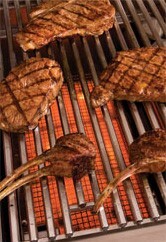 Every detail of the grill promotes this extraordinary Cooking System. Mixing direct heat from specifically placed ports and channels with radiant heat from ceramic briquettes allows your grill to reach higher temperatures and distribute heat evenly to the grates. Your grill will preheat faster, perform better and use less gas. Hexagonal grates retain and conduct more heat into your food and provide more food to surface contact to brand your food with thick restaurant style sear marks. Drafting vents draw cool air from the bottom of the firebox keeping the heat above the burners where it is needed while keeping the air/gas mixture constant for a more efficient flame. Zone dividers enable you to grill effectively with one burner only or regulate each area at a different temperature when cooking different food items. 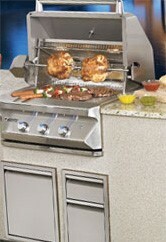 This highly engineered Cooking System will elevate your next outdoor grilling experience to new levels of performance. Quality Control is assured throughout every step of the manufacturing process resulting in superior craftsmanship that will withstand and endure the harsh elements of the outdoors and bring you and your family timeless enjoyment. 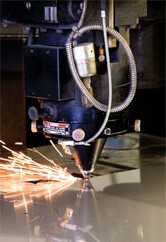 Twin Eagles manufactures the Twin Eagles premium brand, the Delta Heat premier brand, and the Del Sol performance brand.